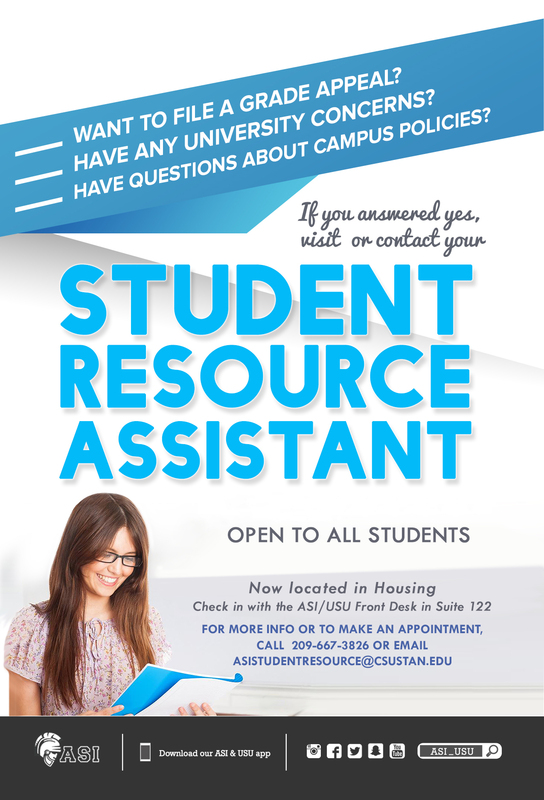 Now located in Housing Suite 122, at the ASI/USU Front Desk, the ASI Student Resource Assistant provides support as a peer mentor for Stanislaus State Students and serves as a liaison for students with faculty and administration. As a currently enrolled student, the Student Resource Assistant is someone who is connected to “student life” and speaks from the student’s perspective. The Student Resource Assistant is dedicated to providing a safe and empowering environment for students and is committed to working for the betterment of all students. Walk-ins welcome. ** Grade appeals may only be submitted in the first four weeks of the semester following the semester in which grade was received. Example: To challenge a grade received for the Fall semester, a grade appeal must be submitted during first four weeks of the Spring semester. Grade appeals may be started during Winter or Summer breaks. For more information, questions or concerns contact the ASI Student Resource Assistant at (209) 667-3826 or email at ASIStudentResource@csustan.edu.